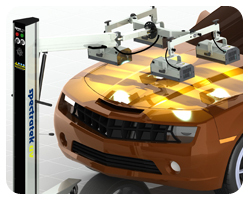 Spectratek UV UltraViolet Curing Lamps are speeding up production across all areas of auto body repair. Pro Line Systems International Inc. offers quality industry approved UV and IR Curing lamps in all sizes and price ranges. Metal (including aluminum) • Plastic • Wood • Concrete • Glass • Composites. Achieve lightning production speed which makes this technology pay for itself fast. Pictured is the Spectratek 34001600 quadruple head UV curing lamp supported by a robust column and arm. The base also provides superior stability and cooling fans in each head provide efficient operation. Multiple head positions system easily contours to the shape of area being cured. Designed in cooperation with international paint manufacturers. Provides almost instant full cure with no heat. Ready to sand, buff and deliver in under 3 minutes. Filters out all harmful UVB and UVC. IP30 Safety Standard Approved (The enclosure provides a protection against access to hazardous parts). 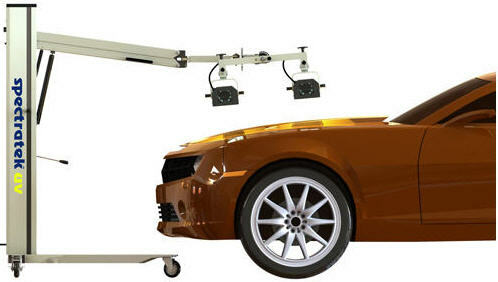 Effortless lamp unit adjustment with gas cylinder and gas booster cylinder provides unlimited positioning versatility. 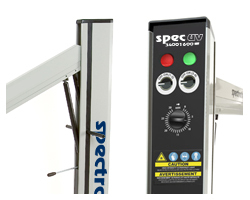 The Spectratek line of IR & UV lamps have earned an exceptional world wide reputation for Build Quality, Performance and Cost Effectiveness from paint manufacturers and technicians alike. Custom configurations from a wall mount and overhead track systems offer tremendous Space Savings and Green Compliance advantages.